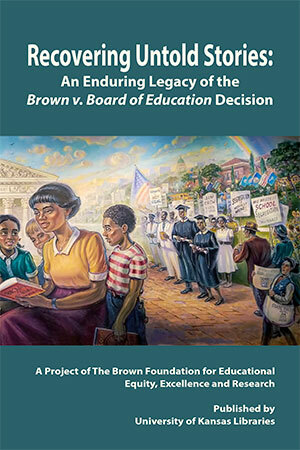 The Brown Foundation for Educational Equity, Excellence and Research was established in 1988 to serve as a living tribute to the attorneys, community organizers and plaintiffs in the landmark U.S. Supreme Court decision of May 17, 1954, Brown v. the Board of Education. Our mission is to build upon the work of those involved in the Brown decision, to ensure equal opportunity for all people. Our cornerstone is to keep the tenets and ideals of Brown relevant for future generations through programs, preservation, advocacy and civic engagement. Learn more about how you can help by making a donation. The U.S. Supreme Court ruling in the five combined cases known only as Oliver L. Brown et. al. v. the Board of Education of Topeka, (KS) et. al. was a monumental judicial turning point for this nation. The legal challenge was originally led by Charles Hamilton Houston and later Thurgood Marshall along with a formidable legal team. The Brown decision dismantled the legal framework for racial segregation. By declaring that the discriminatory nature of racial segregation…”violates the 14th Amendment to the United States Constitution, which guarantees all citizens equal protection of the laws,” Brown v. Board of Education laid the foundation for shaping national and international policies regarding human rights. What the Brown decision represents is at the core of United States history and the freedoms we enjoy. It reaffirmed the sovereign power of the people of the United States in the protection of their natural rights from arbitrary limits and restrictions imposed by state and local governments. Those rights are recognized in the Declaration of Independence and guaranteed by the U.S. Constitution. Learn more, RSVP and pay online here. Download the registration card here. Recovering Untold Stories: An Enduring Legacy of the Brown v. Board of Education Decision was initiated in 2016 by The Brown Foundation for Educational Equity, Excellence and Research, funded by the Hall Center for the Humanities, University of Kansas and The Walton Family Foundation, published by the University of Kansas Libraries. The project was intended to capture the first-person narratives of individuals who were plaintiffs or whose families were represented in the five cases consolidated by the United States Supreme Court in an opinion announced on May 17, 1954. The Court consolidated cases from Delaware, Kansas, South Carolina, Virginia, and Washington, D.C., under the single heading of the Kansas case, commonly known as Brown v. the Board of Education of Topeka. However, the legal citation is Oliver L. Brown, et al. v. the Board of Education of Topeka (KS), et al. We focused on the “et al.,” pronounced “et-ahl,” which is an abbreviation for the Latin phrase “et alia,” meaning “and others.” The United States judicial system uses this phrase as a reference in class action litigation in place of listing the names of all plaintiffs. In the instance of Brown v. the Board of Education, those four letters relegate several hundred men, women and children to what can be characterized as “legal wasteland,” rendering them largely unknown. This project uncovers and publishes some of their stories to provide a glimpse into the role of ordinary people who found themselves in the center of an extraordinary historic milestone. Individuals involved in the cases consolidated under Brown v. Board participated in a series of in-person workshops convened by The Brown Foundation onsite at the National Museum of African American History and Culture in Washington, D.C. The workshops were facilitated by Cheryl Brown Henderson, Founding President of The Brown Foundation, and four University of Kansas scholars: Deborah Dandridge, Curator African American Experience Collections, Kenneth Spencer Research Library; John Edgar Tidwell, English Professor; Darren Canady, Playwright and Associate Professor of English; and Vincent Omni, Graduate Teaching Assistant, English Department. Workshop participants were guided through the process of writing a first-person narrative. The results of their work are contained in this collection of essays, within which each person shares personal experiences, or those of their parents, offering us a better understanding of the risk, challenge and courage of African Americans who refused to be denied constitutional rights in the era of “Jim Crow” laws. In the following quotation from his 1994 book, Crusaders in the Courts: How a Dedicated Band of Lawyers Fought for the Civil Rights Revolution 1st Edition, Attorney Jack Greenberg, member of the NAACP Legal Defense Fund’s legal team in Brown, poignantly refers to the numerous individuals who are embedded within the legal shorthand “et. al.”: "Before lawyers can win cases there have to be clients willing to stand up for their rights. The American Blacks who proved willing to fight segregation and discrimination were organized for the most part by the National Association for the Advancement of Colored People (NAACP), in an environment hostile to change in the kind of justice afforded Blacks." This is a not for profit project, cost recovery only for print on demand. Read online at http://hdl.handle.net/1808/27702 or order a hard copy via print on demand https://www.kubookstore.com/p-147781.aspx. Also, find us on Facebook and "like" our page for more photos and updates. Just click on the facebook logo to the right or go to www.facebook.com/brownfoundationks.